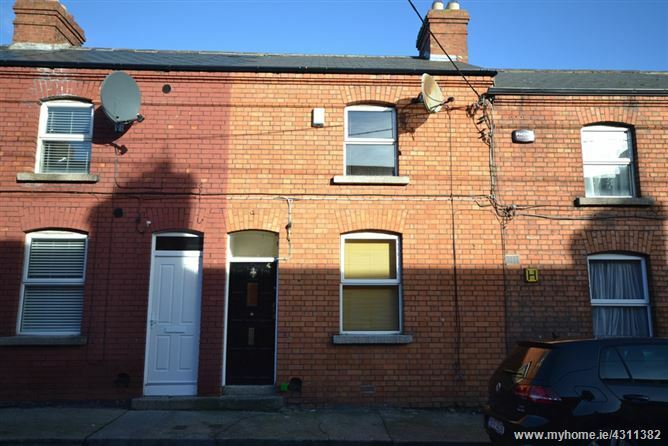 Berkeley & Associates are delighted to offer this charming three bedroom redbrick home tucked away within ‘The Ranch’ area of Lower Ballyfermot. This neatly maintained home briefly comprises a spacious lounge, kitchen extension and ground floor bedroom. Upstairs includes two bedrooms and a family bathroom. This quaint home, built in the early 1900’s, also benefits from a low maintenance gravelled courtyard with rear pedestrian access. Superbly located close to all amenities of Inchicore and Ballyfermot and very accessible to the N4 and Dublin City Centre. ENTRANCE HALL	0.95x0.86	With tiled floor. Alarm pad. LOUNGE / DINING AREA	5.41x4.20m	With carpeted floor and floorboarded area. Ornate coving and centre rose to ceiling. Electric fire with timber shelved surround. Fitted timber alcove shelving. Wall mounted lighting. Dual aspect providing an abundance of natural light. LOBBY	1.85x1.65m	With understairs storage and staircase. Tiled floor. Door to courtyard. Door to.. KITCHEN EXTENSION	2.90x1.91m	Tiled floor & splashback. Modern range of cream fitted wall and floor units, walled mount fan heater. Door to.. BEDROOM 3 3.20x1.88m Laminate flooring, fitted wardrobe, electric storage heater. LANDING	Laminate flooring, access to attic, window to rear. BEDROOM 1	3.10x2.94m	Front aspect. Laminate flooring, wardrobe and electric storage heater. BEDROOM 2	3.29x2.37m	Rear aspect, laminate flooring, wardrobe, eaves storage, electric storage heater. BATHROOM	1.96x1.40m	Fully tilled walls and floors, shower cubicle with electric triton T90xr shower, WC, pedestal WHB with wall mounted mirror. Extractor fan, heater, overhead storage. To the rear there is a small private gravelled patio and door to communal pedestrian laneway.